If you've ever been in a yarn shop and seen a particular yarn displayed in a variety of gorgeous hues and loved all the colors together, you understand the reason for Sweetness. This happened to Amy, deep in the Canadian winter. She called upon her friend in Norway, who happens to be an aspiring knitwear designer. As if by magic, it turns out that Theresa had her own colorful stash of the yarn in question. So a transatlantic design project was born. Sweetness is a simple raglan-sleeved pullover offered in two flavors with almost no finishing - it's worked in one piece, in the round. Very cool. The key to keeping the colors visually manageable is to have the yoke, sleeves and neck in one solid color. Then choose your favorites from the available palette and go nuts with the stripes. Theresa striped hers in lovely regular intervals; Amy's is erratic, just like she is. 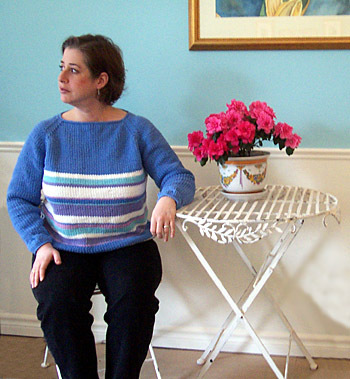 The sweater really is a mellow project; the tangy part is in the underarm finishing. It's only 7 stitches. You can do it. Amy shot on location at La Tea Da, 2305 Queen Street East, Toronto. 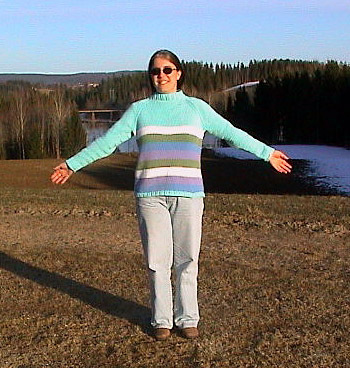 Theresa shot on location in glorious thawing Norway. Note: Theresa used a 6mm needle to get this gauge; Amy used a 6.5mm. Using DPNs, co 24 [27, 33, 36]. Divide sts evenly over 4 needles. Place marker and join [being careful not to twist work] and work in k2, p1 rib for 2 [2.5 , 3, 3.5 ] inches. Change to St st and inc 1 st on either side of marker every 2 [ 1.5, 1.5, 1] inches for a total of 8 increases. 40[43, 49, 52] sts on needles. Note: Change to 16-inch circular needle when there are enough sts to work comfortably. When work measures 16.5[17, 17.5, 18] inches, knit to 3 sts beyond the marked st, then slip the last 7 sts worked onto a piece of contrasting yarn. Put remaining sts on a stitch holder, a length of spare thread or spare circular needle of any size; break yarn leaving a 12-inch tail and repeat for other sleeve. CO 108[124, 140, 156] sts using 30-inch circular needle. Place marker to indicate beg of the round [marker A], join [being careful not to twist work], and work in k2, p1 rib for 54[62, 70, 78] sts. Place another marker [marker B] to indicate the opposite side; it will be easier to differentiate the two markers if they are different colors. Continue in k2, p1 ribbing until piece measures 2[2.5, 3, 3.5] inches. Working stripes as indicated by chart A, B or your own mood, switch to St st and work until body measures 15[16, 17, 18] inches from cast on edge. Join MC to body and k 1 rnd. K to 4 sts past marker A, then slip the last 7 sts worked to a spare length of yarn. Cont in St st until 4 sts past marker B, then place the last 7 sts worked onto a holder and complete the round. At this point, you will have 47[55, 63, 71] sts each for the front and back and 33[36, 42, 45] for each sleeve. 7 sts are held on spare yarn at each underarm and at the top of each sleeve. These sets of 7 sts will be lined up with each other as you join the arms to the body and grafted together during finishing. Attach first sleeve by knitting the 33[36, 41, 45] sleeve sts onto the same circular needle as the body sts. Every time you come to the 7 held sts, just leave them hanging inside the work. You'll deal with them later. Continue in St st until you come to the second set of sts held on spare yarn and attach the second sleeve in the same manner. Finish round. Work in St st over all 160[182, 208, 232] sts for 4 rounds, placing markers at each of the four points where body and sleeve sts meet. If you use a different colored marker for Marker 1 and place it just BEFORE the set of underarm stitches, the beginning of your rounds will be easy to find. The first few rounds after you've joined the pieces will be a bit tight and awkward to knit, but it will soon right itself. Rnd 1: From marker 1: k1, k2tog, then *k to 3 sts before next marker, ssk, k1, slip marker, k1, k2tog* repeat at 3rd and 4th marker, knit to 3 sts before marker 1, ssk, k1. Rnd 2: K around with no decreasing. Work one round plain, dec 1[1, 2, 1] st in order to have a number divisible by 3 for the ribbing: 39[45, 54, 63] sts. Work in k2, p1 rib for 2 inches or until desired length of turtleneck is reached. BO loosely, following rib pattern. Work these 2 rnds 11[13, 15, 17] times more = 64 [70, 80, 88] sts. Place underarm stitches onto two DPNs. Tighten up any looseness by pulling on the individual stitches on the needles. Holding the needles parallel and using the 12-inch tail threaded onto a tapestry needle, graft the 2 sets of 7 sts at each underarm using Kitchener stitch. You may have holes on either side of the grafted area. If so, delicately weave them closed. Just takes time and patience. Theresa has just started her first job in Norway and her knitting productivity has taken a nose dive. She's very much looking forward to Easter break, a traditional week of lazing about and soaking up the first rays of spring sunshine. Watch and see if she gets anything crafty done at her weblog, Bagatell. Amy is the editor of Knitty. She's married and lives in Canada and likes to drink tea from time to time. This sweater was her first ever with raglan sleeves. She very much likes raglan sleeves now. Mostly, she is jumping out of her skin for spring to really arrive already. Pattern & images © 2003 Theresa Vinson Stenersen & Amy R Singer.